Will Lewis, Vice President, Tolco Corp.
Will Lewis is in a unique position as Vice President of the company his grandfather started, reporting to his uncle George Notarianni, Tolco Corporation’s President and CEO. Lewis is not only the third generation to work in the family business; he is also a member of the generation that is changing the face and practices of the Jan-San industry. Lewis’ grandfather William Spengler was a chemical engineer who worked for National Laboratories in Toledo, Ohio, and he was unwilling to move his family across the country when the company relocated. So, in March 1961 he started Tolco Corporation with just one product: the D-22 Drum Pump. Lewis says his mother recalls playing under Spengler’s desk in the family garage in Toledo: “He used to say that FOB meant ‘from our basement’.” As so many entrepreneurs did back in the day, Spengler would load product into his car with maps in hand and prospect for customers. Lewis says his grandfather continued to go to work until he died at the age of 91. Someone would pick Spengler up in the morning and drive him to Tolco, where he would open the mail, visit with employees, and dispense “pearls of wisdom” until about 2:00 in the afternoon. Lewis listened whenever he could to his grandfather’s views on running a successful business and tales of his life as an entrepreneur. Today, Tolco’s lines have expanded from its core business of pumps and trigger sprayers to include other Jan-San products and sanitary supplies, and the company has 60 employees working in its plant and offices in Toledo. November 2017 marked the completion of a warehouse addition that gives the business 40% more space for pallet locations and three new truck bays. 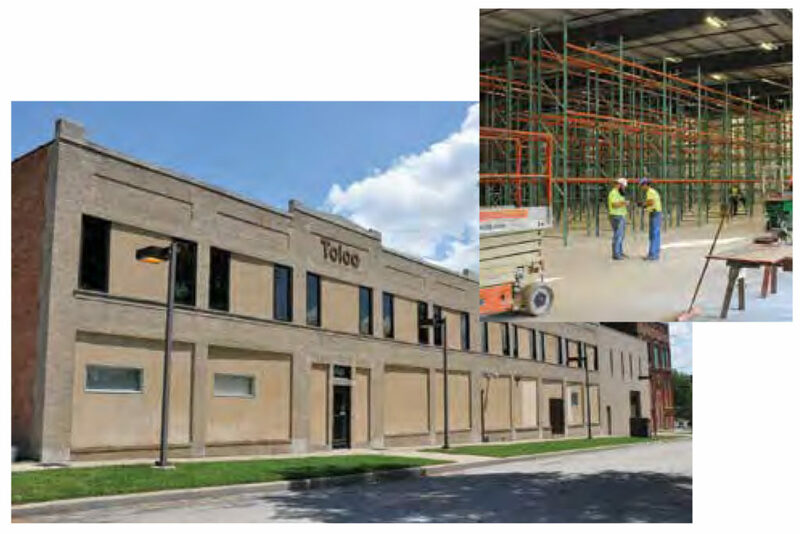 “It’s the first purpose-built warehouse we’ve ever had,” says Alberto (Al) Martinez, Tolco’s Director of Sales and Marketing. Lewis says he didn’t know very much about Tolco until interviewing for a job there just before college graduation. Lewis started work at Tolco in January of 2009 and says that after eight years, he can’t imagine doing anything else. He notes how much he has benefited over the years from the collective experience of industry friends, other manufacturers, and customers. Martinez mirrors those sentiments, describing the Jan-San industry as “infectious” and relationship-based, one that “draws you in and keeps you,” noting that despite industry consolidation there are still many independent, family-owned companies like Tolco in Jan-San. “That’s a really unique dynamic that has been lost in other industries,” he concludes. “The average employee tenure is a testament to this company,” says Martinez: many have been with Tolco no less than 10 years. Martinez once told a potential hire years ago, “There may be companies where you’ll have a more glamorous career or make more money, but you’re never going to have as much fun” as you will at Tolco. “That’s where our mission Be Great and Have Fun comes into play.” Tolco’s first employee retired in 2017 after 40 years, and the company has started to expand its “bench” in preparation for retirement of other key employees. Martinez and Lewis both acknowledge the tensions that can arise between close-to-retirement managers and younger, often new-to-the-industry employees. Martinez says he finds Millennials (like Lewis) have a fresh outlook on the marketplace. Rather than give in to economic pessimism, Millennials are more likely to ask, How can we leverage our relationships, resources and value proposition to stay relevant in the market? 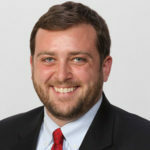 Lewis finished an MBA program through the University of Michigan in May 2017 with a focus on strategy and operations that taught him “models and approaches that you wouldn’t just pick up on the job. We’ve taken some of those concepts and applied them here at Tolco.” One innovation he has introduced at Tolco is automation of the sales process - utilizing data analysis and reporting to help inform sales decisions, quotations and objectives. “The addition of data analysis to highlight what’s important has really made us more effective and relevant,” Martinez states. Martinez believes Jan-San is an industry that doesn’t so much revolutionize as evolve. “And that’s the challenge,” he adds. “How do you make this widget [sic] a better widget or evolve it to the next logical iteration?” When asked about the decision-making process at Tolco, Lewis laughs and replies, “It’s loud!” Employees from sales, purchasing and operations gather to brainstorm and respond to each other, but with one caveat: “We’ve always done it this way” or “It didn’t work last time” are off-limits.